It has been scientifically proven that the best therapist one can ever get has a fur and four legs. A house with them is filled with wagging tails, wet noses and loads of kisses. If you haven’t guessed already, you have no idea what you are missing out. A dog changes life for people in ways one cannot even imagine. It inspires the owner to be a better person and gives a friend that loves you more than they love themselves. Author Grant Fairley said, “If you want loyalty, get a dog. If you want loyalty and attention, get a smart dog.” For me every dog is smart and it has nothing to do with how much I absolutely adore them. Now that I think of it, it has everything to do with them being the adorable big balls of fur they are. However, I do believe that there is an immense difference between a trained dog and an untutored one. Filling up this gap is Pranita Balar with her unique startup BarkNBond. 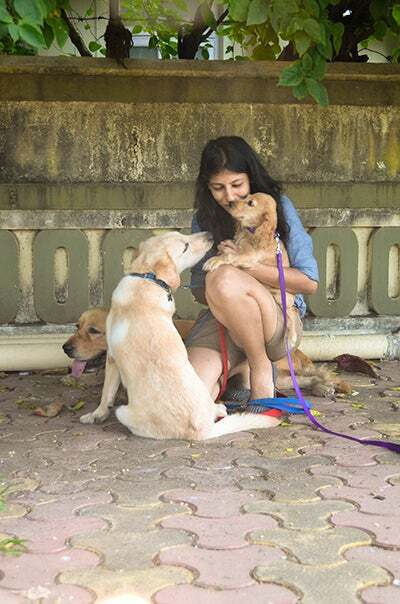 A certified Canine Consultant & Dognition Evaluator, Pranita is on a mission to strengthen the bond that people share with their pets; a bond that holds the potential to be one of the most loving and fulfilling relationships. Exploring this relationship, we asked this true dog lover some questions about her life with dogs and the answers are as heart warming as a dog’s hug. Working with dogs sounds like a dream job to me. Was this always the plan? I have always wanted to be an entrepreneur but until 2012, I didn’t know where to start with. I have a three years of corporate experience in marketing and media field. So clearly, this wasn’t the plan always. In the conventional career sense, I had a full-time corporate job, working in varied industries for more than 3 years; from finance to marketing to media. I shifted and moved a lot of jobs mainly because of a lack of interest after a while. There always reached a stage, where I wasn't motivated to go to work but somehow dragged myself out of bed every day. Then I started re-analysing my interests and kept asking “What next?” I short-listed two major interests, which have been consistent throughout my life – Dogs and Dance. After a lot of research and read up about the canine industry in India, I was curious to give it a shot. I decided to do something around dogs and came across courses on Canine Training & Behaviour. I did the course out of curiosity but till my training session with a client, I didn’t know I had it in me to take it up as long term career plan. Post that there has been no looking back and under BarkNBond I have added variety of services apart from training. My aim is to address the need of spreading awareness among dog lovers and owners about dogs, their behaviour and making the society more pet friendly for the welfare of dogs. 'BarkNBond' says everything about the startup. How did you come up with it? The name came up after brainstorming with couple of friends. We started with usual words that come to your mind when you hear “dog” and ended with BarkNBond. What was your first experience with a dog? Like any other kid I too was scared of dogs. As a matter of fact, my earliest recollection of an encounter with a dog is being chased down three flights of stairs by a Dachshund! But as the popular saying goes that ‘Dogs work their magic on you’, I gradually grew out of my fear and started loving them, and so much so that I desired for a pet. If only we lived in a world where horses were wishes and beggars would ride. Fact be told, my mother dislikes them, and not just dogs, pets in general. This is for obvious reasons – smell, bark, filthiness, items chewed up, and the fact that they are a big responsibility. No matter how much I loved a dog, I would never want to adopt one without a family member’s consent. Since, it would not be the right environment to raise a pet. "Hence, I don't have a pet at home. My biggest challenge has been and still is to convince pet owners why they should go to a professional trainer and behaviourist and why it is worth the money. We still have many traditional trainers and so called self learned behaviourists who charge less and give experimental solution. My style is “shock and awe”. Within first five minutes of your interaction, show the client what you can do and why they should listen to you than to other pet owners or online forums or Social Media comments. How has dogs and BarkNBond changed your life? I have become more patient, better in people skills, more creative, pushing myself to take risks and follow my curiosity where it takes me. With regards to my work skills, I have become better in understanding dogs. What is the craziest thing that has happened to you because of BarkNBond? BarknBond has brought a lot of happiness to me, in terms of – job satisfaction, new friends (who are actually clients), recognition, my first dog. But the craziest thing or you can say overwhelming thing – younger girls looking up to me and being motivated to work, to follow their dreams. I have twice had, mothers mailing me asking about this career for their daughters as they were motivated by me.